Alex (May 1976 – 6 September 2007) was a grey parrot and the subject of a thirty-year experiment by animal psychologist Irene Pepperberg, initially at the University of Arizona and later at Harvard University and Brandeis University. When Alex was about one year old, Pepperberg bought him at a pet shop. The name Alex was an acronym for avian language experiment, or avian learning experiment. Before Pepperberg's work with Alex, it was widely believed in the scientific community that a large primate brain was needed to handle complex problems related to language and understanding; birds were not considered to be intelligent, as their only common use of communication was mimicking and repeating sounds to interact with each other. However, Alex's accomplishments supported the idea that birds may be able to reason on a basic level and use words creatively. Pepperberg wrote that Alex's intelligence was on a level similar to dolphins and great apes. She also reported that Alex seemed to show the intelligence of a five-year-old human, in some respects, and he had not even reached his full potential by the time he died. She believed that the bird possessed the emotional level of a human two-year-old at the time of his death. Animal psychologist Irene Pepperberg bought Alex at a pet store while a researcher at Purdue University. She believes that Alex may have had his wings clipped when he was young, which could have prevented him from learning to fly. Alex's training used a model/rival technique, in which the student (Alex) observes trainers interacting. One of the trainers models the desired student behavior, and is seen by the student as a rival for the other trainer's attention. The trainer and model/rival exchange roles so the student can see that the process is interactive. Pepperberg reported that during times when she and an assistant were having a conversation and made mistakes, Alex would correct them. 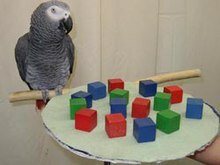 This technique helped Pepperberg succeed with Alex where other scientists had failed in facilitating two-way communication with parrots. In later years, Alex sometimes assumed the role of one of Pepperberg's assistants by acting as the "model" and "rival" in helping to teach a fellow parrot in the lab. Alex sometimes practiced words when he was alone. Pepperberg did not claim that Alex could use "language", instead saying that he used a two-way communications code. Listing Alex's accomplishments in 1999, Pepperberg said he could identify 50 different objects and recognize quantities up to six; that he could distinguish seven colors and five shapes, and understand the concepts of "bigger", "smaller", "same", and "different", and that he was learning "over" and "under". Alex passed increasingly difficult tests measuring whether humans have achieved Piaget's Substage 6 object permanence. Alex showed surprise and anger when confronted with a nonexistent object or one different from what he had been led to believe was hidden during the tests. Alex had a vocabulary of over 100 words, but was exceptional in that he appeared to have understanding of what he said. For example, when Alex was shown an object and was asked about its shape, color, or material, he could label it correctly. He could describe a key as a key no matter what its size or color, and could determine how the key was different from others. Looking at a mirror, he said "what color", and learned "grey" after being told "grey" six times. This made him the first and only non-human animal to have ever asked a question (apes who have been trained to use sign-language have so far failed to ever ask a single question). Alex's ability to ask questions (and to answer to Pepperberg's questions with his own questions) is documented in numerous articles and interviews. Alex was said to have understood the turn-taking of communication and sometimes the syntax used in language. He called an apple a "banerry" (pronounced as rhyming with some pronunciations of "canary"), which a linguist friend of Pepperberg's thought to be a combination of "banana" and "cherry", two fruits he was more familiar with. Alex could add, to a limited extent, correctly giving the number of similar objects on a tray. Pepperberg said that if he could not count, the data could be interpreted as his being able to estimate quickly and accurately the number of something, better than humans can. When he was tired of being tested, he would say "Wanna go back", meaning he wanted to go back to his cage, and in general, he would request where he wanted to be taken by saying "Wanna go...", protest if he was taken to a different place, and sit quietly when taken to his preferred spot. He was not trained to say where he wanted to go, but picked it up from being asked where he would like to be taken. If the researcher displayed irritation, Alex tried to defuse it with the phrase, "I'm sorry." If he said "Wanna banana", but was offered a nut instead, he stared in silence, asked for the banana again, or took the nut and threw it at the researcher or otherwise displayed annoyance, before requesting the item again. When asked questions in the context of research testing, he gave the correct answer approximately 80 percent of the time. Once, Alex was given several different colored blocks (two red, three blue, and four green—similar to the picture above). Pepperberg asked him, "What color three?" expecting him to say blue. However, as Alex had been asked this question before, he seemed to have become bored. He answered "five!" This kept occurring until Pepperberg said "Fine, what color five?" Alex replied "none". This was said to suggest that parrots, like children, get bored. Sometimes, Alex answered the questions incorrectly, despite knowing the correct answer. Preliminary research also seems to indicate that Alex could carry over the concept of four blue balls of wool on a tray to four notes from a piano. Pepperberg was also training him to recognize "4" as "four". Alex also showed some comprehension of personal pronouns; he used different language when referring to himself or others, indicating a concept of "I" and "you". In July 2005, Pepperberg reported that Alex understood the concept of zero. If asked the difference between two objects, he also answered that; but if there was no difference between the objects, he said "none", which meant that he understood the concept of nothing or zero. In July 2006, Pepperberg discovered that Alex's perception of optical illusions was similar to human perception. Pepperberg was training Alex to recognize English graphemes, in the hope that he would conceptually relate an English written word with the spoken word. He could identify sounds made by two-letter combinations such as SH and OR. Alex's death on 6 September 2007, at age 31, came as a surprise, as the average life span for a grey parrot in captivity is 45 years. His last words ("You be good, see you tomorrow. I love you") were the same words that he would say every night when Pepperberg left the lab. Some in the scientific community are skeptical of Pepperberg's findings, pointing to Alex's communications as operant conditioning. Critics point to the case of Clever Hans, a horse who could apparently count, but who was actually understanding subtle cues from the questioner. In another case, Nim Chimpsky, a chimpanzee, was thought to be using language, but there is some debate over whether he simply imitated his teacher. Herbert Terrace, who worked with Nim Chimpsky, says he thinks Alex performed by rote rather than by using language; he calls Alex's responses "a complex discriminating performance", adding that in every situation, "there is an external stimulus that guides his response." However, supporters of Alex say he was able to talk to and perform for anyone involved in the project as well as complete strangers who recorded findings, though such interactions do not involve the strict conditions required to exclude rote and operant responding. ^ "The Alex Foundation". 10 September 2007. Archived from the original on 25 September 2007. Retrieved 12 September 2007. ^ a b c d Smith, Dinitia (9 October 1999). "A Thinking Bird or Just Another Birdbrain?". The New York Times. Retrieved 11 September 2007. ^ a b c "Farewell to a famous parrot". Nature. ^ Pepperberg, Irene (2009). Alex & Me: how a scientist and a parrot discovered a hidden world of animal intelligence and formed a deep bond in the process. Scribe Publications. ISBN 9781921372728. ^ a b Scientific American (12 September 2007), An Interview with Alex, the African Grey Parrot. sciam.com. Retrieved 12 September 2007. ^ Irene Pepperberg (1998), Talking with Alex: Logic and speech in parrots. Scientific American. Retrieved 12 September 2007. ^ a b "Bird Brain Dies After Years of Research". Associated Press via USA Today. 11 September 2007. Retrieved 31 October 2007. Alex, a parrot that could count to six, identify colors and even express frustration with repetitive scientific trials, has died after 30 years of helping researchers better understand the avian brain. ^ "Alex the Parrot, an Apt Student, Passes Away". NPR. 10 September 2007. Archived from the original on 8 January 2009. Retrieved 19 January 2009. ^ "A Little Bird Told Me". Seed Magazine. 12 September 2007. Retrieved 24 November 2009. ^ a b Wise, Steven M. (2002). Drawing the Line. Cambridge, Massachusetts: Perseus Books. pp. 94–96. ISBN 0-7382-0340-8. ^ a b Wise, Steven M. (2002). Drawing the Line. Cambridge, Massachusetts: Perseus Books. p. 93. ISBN 0-7382-0340-8. ^ a b Wise, Steven M. (2002). Drawing the Line. Cambridge, Massachusetts: Perseus Books. pp. 90–92. ISBN 0-7382-0340-8. ^ Wise, Steven M. (2002). Drawing the Line. Cambridge, Massachusetts: Perseus Books. pp. 101–102. ISBN 0-7382-0340-8. ^ Benedict Carey (10 September 2007), "Alex, a Parrot Who Had a Way With Words, Dies". The New York Times. Retrieved 11 September 2007. ^ a b c Wise, Steven M. (2002). Drawing the Line. Cambridge, Massachusetts: Perseus Books. p. 107. ISBN 0-7382-0340-8. ^ Jordania, Joseph (2006). Who Asked the First Question? The Origins of Human Choral Singing, Intelligence, Language and Speech. Tbilisi: Logos. ISBN 99940-31-81-3. ^ a b Wise, Steven M. (2002). Drawing the Line. Cambridge, Massachusetts: Perseus Books. p. 108. ISBN 0-7382-0340-8. ^ Wise, Steven M. (2002). Drawing the Line. Cambridge, Massachusetts: Perseus Books. p. 106. ISBN 0-7382-0340-8. ^ "Researchers explore whether parrot has concept of zero". Archived from the original on 2007-09-03. Retrieved 11 September 2007. ^ Wise, Steven M. (2002). Drawing the Line. Cambridge, Massachusetts: Perseus Books. p. 104. ISBN 0-7382-0340-8. ^ Irene M. Pepperberg (January 2009). "Think Animals Don't Think Like Us? Think Again". Discover magazine. Archived from the original on 24 January 2009. Retrieved 26 January 2009. ^ Chandler, David L. (18 May 1998). "This bird talks, counts, and reads – a little". Boston Globe. p. D01. Archived from the original on 3 October 1999. Retrieved 13 September 2007. ^ "Psittacus erithacus (grey parrot)". Animal Diversity Web. Retrieved 2018-02-08. ^ "Basic Information Sheet: African Grey Parrot | LafeberVet". LafeberVet. 2014-09-28. Retrieved 2018-02-08. ^ "Bird brain Alex the parrot dies". CNN. 12 September 2007. Archived from the original on 17 September 2007. "Alex (parrot), on season 12, episode 1". Scientific American Frontiers. Chedd-Angier Production Company. 2001–2002. PBS. Archived from the original on 2006. Life with Alex: a memoir Film tribute to Alex. This page was last edited on 4 March 2019, at 05:22 (UTC).